At very high pressure, ice exists in two forms : phase VII, where each hydrogen is bonded to two oxygens (by a covalent bond and a hydrogen bond), and phase X, where the hydrogen atoms are located midways between two oxygens. 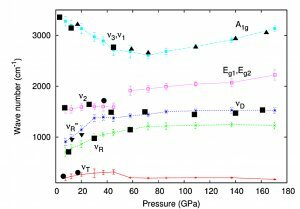 The transition from phase VII to phase X has been observed experimentally at about 65 GPa, whereas ab initio calculations, that treat the proton as a classical particle, find a transition pressure of 100 GPa. This difference is due to the quantum nature of hydrogen nuclei, which is important even at ambient temperature. Quantum effects, such as proton tunneling and zero-point energy, create a “gray area”, blurring the transition. Using an original simulation method, researchers from the team “Oxides in low dimension” from the INSP, in collaboration with a researcher from the IMPMC, have been able to recover the experimental transition pressure value, and explain in detail the transition mechanism, distinguishing the different roles played by quantum and thermal effects. where m is the nucleus’ mass, a and v its acceleration and velocity respectively, f is the external electronic force to which it is submitted, R is a random force (given by the QTB) and α a friction coefficient. The stochastic noise R that is introduced in this equation allows to reproduce (exactly in the case of a harmonic potential) the dispersion of the wave function associated to the atomic nucleus. 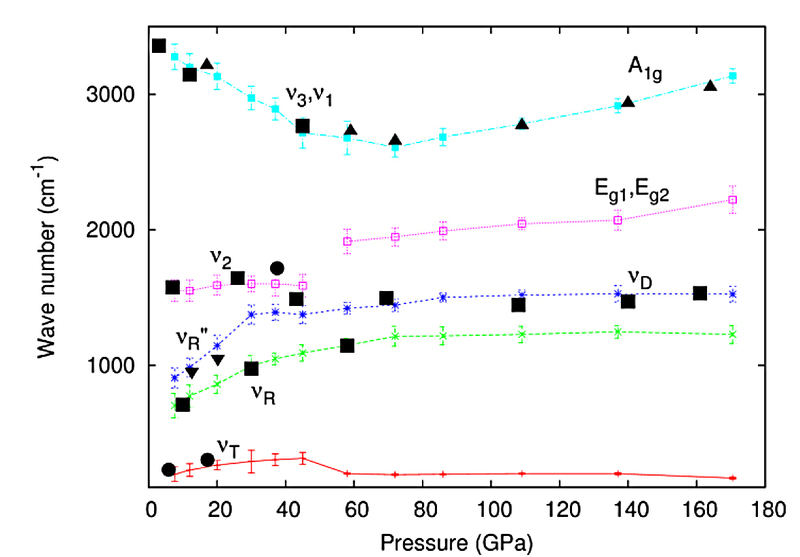 Applied to the problem of ice under high pressure, this method has allowed to reproduce very well the experimental results : the structural properties of ice, the transition pressure, as well as the experimental vibration spectra (see figure 1). Furthermore, the use of the QTB method allowed us to understand the transition mechanism, and the major role played by the system’s zero point energy. Indeed, the researchers have described the mean-field potential felt by the hydrogen with a model close to the Landau model of second-order phase transitions. 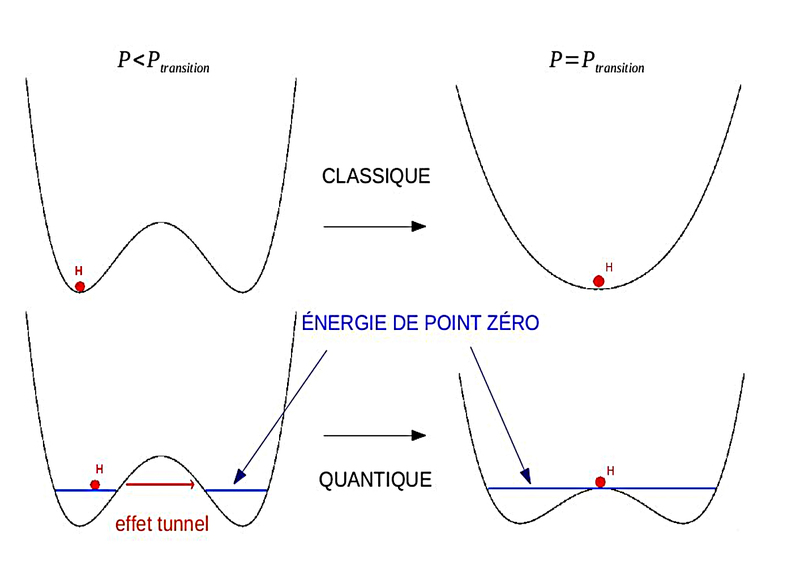 From a classical point of view, the transition happens when the potential barrier disappears, while from a quantum point of view, the transition takes place when the zero-point energy equals the barrier (see figure 2). Finally, in order to take into account thermal effects, a first approximation is to slightly increase the zero-point energy by summing the zero-point energy contribution and the classical thermal energy. Thanks to this analysis, they showed that the quantum effect is dominant compared to the thermal effect, even at high temperature, all along the transition from the phase VII to the phase X of ice. Vibrational frequencies obtained with the “Quantum Thermal Bath” method, as a function of pressure at ambient temperature. The black dots correspond to experimental measurements (Raman and infrared spectra). .
Scheme of the transition in ice at high pressure, from a classical and a quantum point of view. In this work, the researchers established that nuclear quantum effects are a key element in the transition from ice VII to ice X, even at ambient temperature. 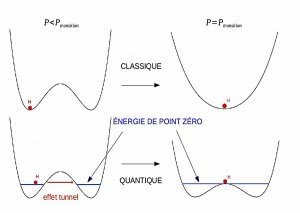 Moreover, they were able to distinguish between the roles played by quantum tunneling and zero-point energy regarding the delocalization of the protons. This makes this transition an interesting example of a quantum-driven phase transition. Finally, this study allowed to prepare and improve tools for the study of nuclear quantum effects in other systems where protons play an important role.